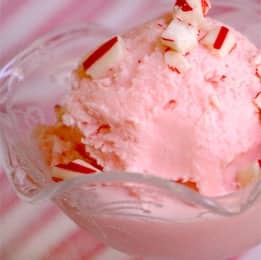 When I was a little girl, one of my favourite Christmas treats was pink peppermint ice cream. Now it's available all year round, but commercial ice cream is so full of additives, I almost always make my own. This recipe is so easy to prepare and because it isn't custard based, it can be churning in your ice cream machine in about five minutes. If you can't find super-fine sugar, just whiz regular sugar around in a blender or food processor for a few seconds to create a finer texture. For a vanilla version of this recipe, see Note below. Whisk cream, milk, sugar, peppermint extract, food coloring and peppermint candy together in a large bowl until sugar is completely dissolved (for vanilla ice cream, see Note below). Pour into the frozen bowl of an ice cream maker, and freeze according to manufacturer's directions. It usually takes about 20 minutes. Ice cream will be soft set. Pour into a large freezer proof container (I like to use a glass loaf pan), cover with plastic wrap and freeze until solid, about 2-3 hours. Vanilla Bean Variation: Omit peppermint extract, candies, and food coloring. Replace with 1 tablespoon vanilla bean paste and churn in ice cream maker as directed.